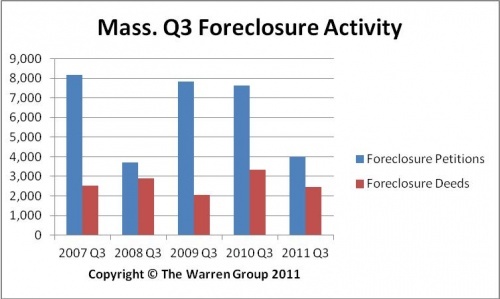 BOSTON, October 20, 2011 – Foreclosure activity statewide dropped again in September, marking the 12th consecutive month that both petitions and deeds declined by double-digit percentages from the same month in the prior year, according to The Warren Group, publisher of Banker & Tradesman. Year-over-year petitions were down in September, dropping to 1,164 – a near 51 percent decline from 2,358 in September 2010. This is the third consecutive month petitions have exceeded 1,000 – and the fifth month so far this year. A total of 9,417 foreclosure petitions have been initiated so far this year, down 55 percent from 20,964 petitions filed the same period last year. A total of 737 foreclosure deeds were recorded in September, a 17 percent drop from 890 during the same month a year ago. A total of 6,204 foreclosure deeds have been filed so far this year, a 42 percent decrease compared to 10,777 deeds recorded during the same period last year. The number of auction announcements tracked by The Warren Group also decreased in September. Auction announcements declined 33 percent to 1,545 from 2,301 in September 2010. From January through September, 12,918 auctions have been announced, a 43 percent decline from 22,757 auctions during the same period in 2010.